Fit-Ink: Got Epic? Go Ski Big Sky--For Free! Remember how last year around this time you were practically swimming in snow there was so much of it at many of the country's resorts that you just couldn't wait to go skiing again and again? I still remember the snow piles taller than the cars that lined the canyon road to Alta. Remember the forecast for a repeat of La Niña for this season's weather patterns? Funny how things work out. Fast forward to the 2011-2012 season and chances are you're doing a snow dance every spare moment in hopes that the fluffy white stuff starts falling--and fast--from the sky before you skip out on that ski day to hike or bike instead. It's easy to say that the snow is far from plentiful in some parts of the U.S., mainly favorites like California, Colorado and Utah. It's always snowing somewhere, as Warren Miller would say at the end of every one of his movies. Except this year that snow is missing a large chunk of the country. So while California, Colorado and Utah are waiting for their dumps to arrive, Jackson Hole, Grand Targhee, Big Sky and Sun Valley, to name a few more northerly locales, are living it up with some of the best late December/early January skiing they've seen in years. Maybe best is stretching it, but in comparison, it's pretty darn good. Just ask the Salt Lake local we rode the lift with last Thursday--he was taking off for Jackson the following day in search of powder. Instead of keeping all the snow to itself, Big Sky Resort, just outside of Bozeman, Mont., decided to share its terrain with those searching for powder. The resort is calling the powder hounds of California and Colorado, those who hold Epic Passes, to ski free during the month of January. Yes, you read correctly: gratis, free, for no dough. Big Sky currently boasts the most skiable terrain in the Rockies with 3,381 acres open, 155 named runs, and they're spreading the love. But with all this skiable terrain comes the promise of something better--even beyond the powder that you're craving. Big Sky doesn't get nearly as crowded as many of those other resorts, which means more turns, more fresh lines and less waiting. The terrain challenges and Lone Peak beckons. The cold never seems as chilly as the thermometer says--I walked to the half-mile to the hot tub wearing flip flops and shorts when it was barely above zero. And with school back in session, you're practically guaranteeing yourself an intimate mountain experience. The one catch? 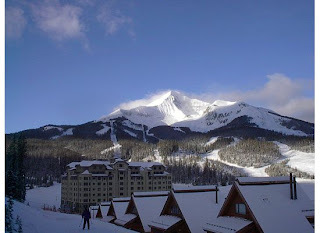 To ski and ride free, skiers and boarders have to book lodging with Big Sky Central Reservations and ask for the Epic Package--then they can ski free from check-in to check-out. The resort is also extending the Bring a Buddy Coupon to passholders if they have friends on the reservation who don't have the Epic Pass; they will be able to ski for $74 a day, a $10 savings off the ticket window price. Anyone up for skiing Lone Peak? Me. Or powder? Me. Or in between the trees? Me (as long as they're spaced out). Click here to read more and start planning. And if you want a stowaway in your suitcase, be sure to let me know and I'll leave a moment's notice. I still haven't unpacked from my last excursion.